Volkswagen has opened the order books for its new flagship SUV – the third generation Touareg. Boasting the latest assistance systems, some of them appearing for the first time in a Volkswagen, the Touareg also offers the option of the new Innovision Cockpit which comprises an intuitive digital operating, information, communication and entertainment unit that can be fully personalised. The 2018 Touareg is the latest milestone in the largest product offensive in Volkswagen’s brand history. The global SUV range, led by the new car, now consists of the new T-Roc, the Tiguan, the new Tiguan Allspace, the new Atlas (USA) and its new sister model Teramont (China). Meanwhile the T-Cross compact SUV – shown in concept form as the T-Cross Breeze – is also due to make its global debut in 2018. A zero emission model has already been decided upon, too, in the shape of the I.D. CROZZ – the first fully electric SUV from Volkswagen. It will be launched in 2020. Debuting with V6 turbocharged engines the Touareg comes with an eight-speed automatic Tiptronic gearbox and 4MOTION all-wheel drive. In the UK, the car will initially be offered with a 282 bhp 3.0-litre V6 turbo diesel unit or, from the autumn, a 228 bhp version of the same engine. A 335 bhp 3.0-litre V6 turbocharged petrol engine will be available to order in the UK in late 2018, with deliveries of that powertrain beginning in 2019. In addition a plug-in hybrid drive with a system power of 362 bhp is first planned for introduction in China. The exact launch date of the Touareg with plug-in hybrid drive in Europe has yet to be set. With a torque peak of up to 443 ft lb, the 282 bhp 3.0 V6 TDI also showcases the new Touareg’s extensive towing capacity. Capable of hauling braked trailer weights of up to 3.5 tonnes, the new car also boasts the latest iteration of Volkswagen’s handy Trailer Assist technology to facilitate simple slow-speed manoeuvring. The 3.0 V6 TDI with 282 bhp (2,967 cc) generates its torque peak of 443 ft lb from only 2,250 rpm, and offers 42.8 mpg on the combined cycle. 0-62 mph takes 6.1 seconds, and the Touareg’s top speed is 146 mph. 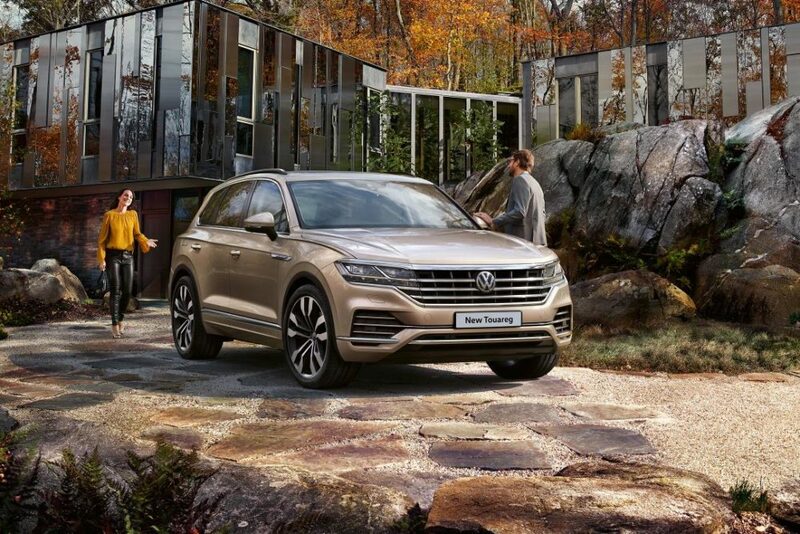 The new third generation Touareg is equipped with permanent all-wheel drive (4MOTION) mated to an eight-gear automatic Tiptronic gearbox with ‘shift by wire’ functionality. A centre differential lock with asymmetric dynamic torque distribution acts as a transfer box for the flow of forces between the front and rear axle. A maximum of 70 per cent of the drive force reaches the front axle and up to 80 per cent can be sent to the rear axle. Offered here in three trims: SEL, R-Line and new R-Line Tech, the five-seat Touareg sits on the Volkswagen Group’s modular longitudinal matrix (MLB). Wider and longer than before, the new SUV’s dimensions are 4,878 mm long (+77 mm); 2,193 mm wide (including wing mirrors, +44 mm) and 1,702 mm high (-7 mm). The five-door, five-seat Touareg offers a 1,051 mm load length and maximum load capacity of 810 litres (seats up) or 1,800 litres (seats down). Kerb weight is 2,070 kg for the launch car. One of the many technical innovations in the new Touareg is the option of the Innovision Cockpit. The 12-inch digital instrument cluster – Active Info Display – merges with the 15-inch TFT touchscreen of the new Discover Premium infotainment system to form a new digital operating, information, communication and entertainment unit. The Innovision Cockpit is the control centre of an interactive interface in which the information and settings of all essential comfort, assist and infotainment systems converge in one simple-to-use matrix. Thanks to a separate eSIM mobile data connection, the new SUV is also “always on”. Indeed, never before has a Volkswagen interior of this type been digitalised and extensively linked to the vehicle functions and outside world to such an extent. More broadly, today’s Touareg features a new generation of assistance, driving dynamics and comfort systems includes technologies such as Night Vision (thermal imaging camera); Traffic Jam and Roadwork Lane Assist (partly automated steering and lane departure warning up to 37 mph, acceleration and braking); Front Cross Traffic Assist (responds to traffic crossing in front of the Touareg); active all-wheel steering; and a new roll stabilisation system with electromechanically controlled anti-roll bars. Welcoming the arrival of the new Touareg to Volkswagen Retailers nationwide Alison Jones, Director of Volkswagen UK, said: “The new Touareg signals yet another important development in Volkswagen’s growing SUV line-up.